I teach online Seminary for our Stake, for those kids who live too far away to attend early morning Seminary. This year we are studying the Doctrine and Covenants and last week we studied the sections 103-105, that deal with the history of Zion's Camp. Zion's Camp was an army organized by the prophet Joseph Smith to march from Kirtland, Ohio to Independence, Missouri to assist the Saints that had been attacked there and to reclaim the land that had been confiscated by mobs. The army was not large, around 200 men, and they endured many trials on their 900 mile trek, including lack of fresh water, food, persecution, and cholera. I have often thought of the women and children who were left behind in Ohio as their husband's and son's (and most of the church leadership) went with Zion's Camp, and how they must have struggled to hold things together back in Kirtland. Yet I was surprised as I studied the history of Zion's Camp this time to learn that there were at least 12 women and 7 children who also traveled with the camp. Map of Zion Camp's march, nearly 900 miles one way. They were given D&C 105, in which they were told Zion would not be redeemed, on the banks of the Fishing River. Only about 20 miles from their destination. I think we forget that throughout history women have often traveled with armies and military campaigns, often in the rear of the army as cooks, laundresses, and nurses. This is true of just about all wars throughout history. Remembering this fact can help you learn to "see" the women in the wars of the Bible and the Book of Mormon. There were almost always women who traveled with armies and military campaigns, but you rarely ever hear about them. Yet, the women of Zion's Camp are unique in that while they probably did assist with the cooking and the laundry it doesn't seem to be their main reason for being included. In fact, Joseph Holbrook, who traveled with his wife and two small daughters, wrote about an interesting experience that the women of Zion's Camp had shortly before the camp made its way into Missouri. "When we came to the Salt River Creek in Missouri, about 50 miles west of Louisiana, we tarried for some three or four days to wash, etc. Then Brother Joseph Smith counselled those that had families to get houses for them, and for the man to go forward with the camp. So I provided a house for my family as decided and was about to leave my family as was the rest of the brethren who had wives with them. Then Brother Joseph Smith said, if the sisters were willing to undergo a siege with the camp they could all go along with it, whereupon they said they could and said they liked Brother Joseph much better than before for the privilege he gave them of continuing with the camp. We don't know why Joseph Smith changed his mind and decided that "if the sister were willing" they could continue on with the army. Maybe the sisters felt afraid or at upset at being left behind by themselves or maybe he felt that the women had earned the right, by facing the same trials as the men, to decide for themselves if they would go or not. It impresses me that these women chose to go with the camp. We have to remember that they were facing some major persecution in Missouri and they fully expected to be confronted with physical violence. These women showed real courage in being willing to march into battle (even with little children in tow) and to follow the prophet where ever he would lead them. Often when we share the story of Zion's Camp we focus on how it was a defining spiritual experience for many of the church's future leaders, and I think that same idea can be applied to the women who also traveled with the camp. 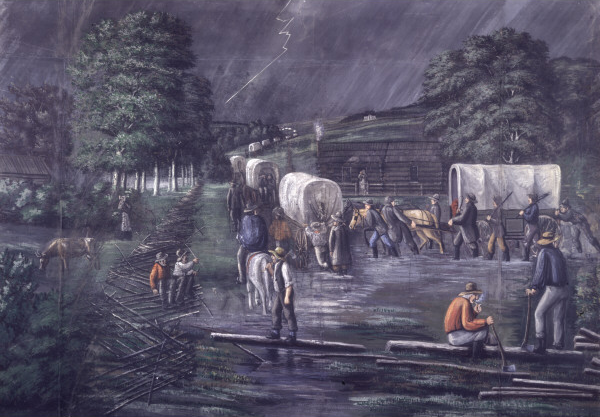 It is significant that all of the women and children who traveled with the camp remained faithful to the church, in addition to facing the extreme persecutions of Missouri, the trials of Nauvoo, and making the trek across the wilderness to Salt Lake City, Utah. In fact, it is interesting to note that the participants of Zion's camp walked 900 miles to Missouri, and many of them walked 900 miles back to Ohio. Later most of them would walk the 1,032 miles from Winter Quarters to the Salt Lake Valley, which must have seemed like a similar trip to the one they had made before! It was powerful for me to study about each one of these women and to imagine what her life must have been like and what her motivation must have been for wanting to travel with Zion's Camp. These women's experiences and lives were different, but they were tied together by a common thread of faith and their examples are important for us today. I hope that you will enjoy learning about these women as much as I did, and that next time you talk about Zion's Camp you can remember to add them into your conversation. If you are interested in learning even more there is a wonderful article written by Andrea G Radke entitled "We Also Marched: The Women and Children of Zion's Camp, 1834" that gives an in-depth look at each many of these women's lives and their experiences. Charolotte Alvord was about 18- years-old when she traveled with Zion's Camp, and since there is no other person with the last name of Alvord recorded as traveling with Zion's Camp it can be assumed that she traveled independently. It intrigues me to think of what her motivation was for going with Zion's Camp. Perhaps she was traveling with friends, relatives or maybe intended to meet up with family or associates who were already in Missouri. Or there is always the possibility that she, like some of the young men who went, wanted to do all she could to redeem Zion. Her story is also fun because it involves romance. While she traveled with Zion's Camp she met a young man named Lyman Curtis, who was traveling with his brother Mecham and sister-in law Sophronia. Lyman and Charlotte fell in love and were married not long after Zion's Camp reached Missouri. She and Lyman later went on to have 11 children and both traveled with the Saints to Nauvoo and later to Salt Lake City. Little is know about her expect that she was married to Mecham Curtis, which means that Charlotte Alvord (mentioned above) would have become her sister-in law. Many of those traveling to Missouri with their families intended to stay in Missouri and join with the saints there. It makes sense to me that the reason she and her husband were both traveling with Zion's Camp was that they intended to stay in Missouri permanently. Mary traveled with her husband John M. Chidester and their two young children, John P. Chidester (age 2) and Eunice Chidester (age 1). I assume that like some of the other families who traveled with Zion's Camp that they were intending to settle in Missouri. It is impressive to me to think about Mary traveling such a long distance with two very small children. Joseph Smith had a hard time finding men willing to volunteer to go with Zion's Camp. The Lord initially told Joseph that he needed 500 men in order to redeem Zion, but said that if he couldn't find enough then they should only go if they had 100 men willing to march (D&C 103:30-34). I think it says something about they type of faith and testimony that Mary and her husband John had that they volunteered to go with Zion's camp, and bring along their children, at a time when many of the grown men of the church were unwilling to go. She certainly demonstrated incredible faith and courage that not only gave her power to travel with Zion's Camp, but also to remain faithful throughout the struggles in Missouri and Nauvoo. Eventually Mary and her family would travel West and settled in Southern Utah. 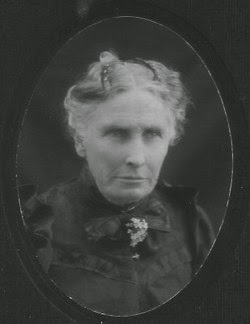 Ada Clements and her husband Albert Clements joined the church in Palmyra, New York and moved to Kirtland, Ohio in about 1833. They only lived there about a year before they traveled with Zion's Camp in May of 1834. Ada and Albert had five living children at the time of their departure, Alvin (about 12), Lucy (about 9) , Paul (about 5), James (about 2), and Eliza who had been born in Ohio and was about 2 months old. None of the children are listed as traveling with the camp and so it might be that they were left in the care of others while their parents traveled. Personally I find it hard to believe that she would have left behind a two- month-old daughter! There is always the possibility the children did travel with the camp as well but were undocumented. Either way, after Zion's Camp the Clements settled in Missouri, as the next two of their children were born in Missouri in 1836 and 1839. "Albert was not home at the time but away from home working for church interests and to support his family when he heard the terrible news about the prophet, he immediately started for home. On the way his horse took sick and he stopped at a store to obtain medicine. Here he met his friend Sidney Rigdon who had converted him. Sidney told Albert he was hurrying back to Nauvoo to be with the Saints during the time of sorrow and to take his place as their leader. Albert was happy to learn of Mr. Rigdon's decision. Later, both Ada and Albert would remarry and be widowed. Later, at the age of 71, Albert finally came West and he and Ada were remarried in 1872. "It seems likely that Mary Snow attended the St. Johnsbury Female Academy, established in 1824 by an act of the General Assembly of Vermont. She had a good education "and knew her astronomy like most people know their alphabet." She married Jacob Gates in March 1833 and she and Jacob were baptized members of the Church by Orson Pratt, June 18, 1833 as were Gardner Snow, Willard Snow, and Lucina Snow. After they left St. Johnsbury, they had many experiences in Missouri. Some years later, Mary and Jacob Gates arrived in the Salt Lake Valley, along with Willard. Erastus told of his sister Mary's down-to-earth outlook. Mary, idealistic, spiritual and intellectual, was also practical and sensible... In St. George, where Mary and Jacob lived much of their lives she was always regarded as a lady of great learning, erudition, and wisdom." Jacob Gates served a mission to the New England States from June 1843 to May 1844. It appears from Susa Young Gates story that Mary either went with him on his mission (his health had been feeble) or she had met him upstream on his return home. It is exciting to get more glimpses into these early pioneer women's lives, and how interconnected they all would have been! "I am aware that she has long since been an unwelcom visiter to her brothers and all of your family & everybody els & it is a miserable condition for any one to be in. You know she has been insane one half of her half of & the spirit she has cherised has produced but little comfort to her self or me but with all her faults I neve harber biterness in my heart toard her for I believe her naturley to be a good woman." Latter-day Saint women suffered some real atrocities under the mobs in Missouri and it breaks my heart to think that Mary may have suffered long-term because of what she went through there. Monument that commemorates those who died as a result of the outbreak of cholera among Zion's Camp. 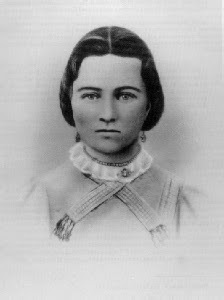 Betsy Parish, who traveled with her husband Warren Parish, was the only woman to die during Zion's Camp. She was among the thirteen camp members to die from the cholera outbreak in the camp. Many others, including Nancy and Eunice Holbrook, also contracted cholera but recovered. Cholera is a high contagious disease that cause violent spams and uncontrollable vomiting. Today we know that it is passed through drinking contaminated water, but it is still a deadly disease that can be hard to control. Many among the camp felt that the cholera outbreak was a punishment from God for the murmuring and discord that had sprung up among the members. 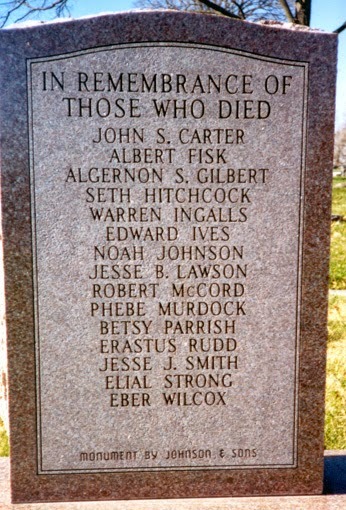 You will notice on the picture of the monument (above) that above Besty's name is the name Phebe Murdock. Phebe was the daughter of John Murdock, an older sister to the two Murdock twins adopted by Emma and Joseph Smith. Author Kenneth R. Mays wrote this about her death. Alanson served as the Bishop in the Iowa Territory from 1839- 1841. But it appears that he was removed from his office for poor behavior. William Clayton recorded in his journal on April 7, 1841 that at a conference of the church, "Alanson Ripley had his Bishopric taken from him for frequently being drunk and not fit for business." (Source) Despite this the Ripleys appear to have remained faithful because they both received their endowment in the Nauvoo temple in 1846. 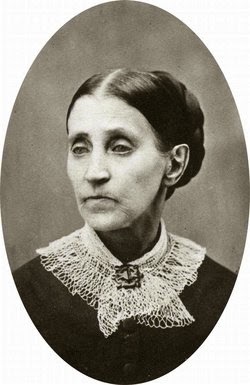 Sarah Lucretia Holbrook Tolman who traveled with Zion's Camp at the age of 2. She was the daughter of Nancy Lambson Holbrook.
" I spent two or three hours with them while my wife was getting dinner. This was on Friday and I commenced reading that evening, but being brought up not to spend any time on a weekday to read, I thought I must work and as my cart was in the field where I left it the day before where I was digging potatoes, I went to digging potatoes, but soon found I could not content my mind at work. I returned to the house, took the Book of Mormon, and read for a few hours but as this was so unusual a thing for me to stop work in the daytime, my wife became alarmed and thought I had better be at work than spending the time reading such deception, which called my attention again to my potato digging. I had not dug long before I wished with all my heart I knew all there was in that book. I went out into a large place nearby where the thistles were very large and thick. I knelt down to pray. I no sooner closed my eyes than it seemed as though the whole thistle plantation was in motion. I opened my eyes. I could see nothing the matter. I closed my eyes the second time when it seemed as if there was a whistle wind among the thistles, yet I felt no wind. I continued my prayer for the forgiveness of my sins and for the Lord to lead me right and show me the truth of Mormonism. When I rose, I said I would go to the house and read the Book of Mormon, work or no work. This was the after-part of Saturday. I read that day and night late. 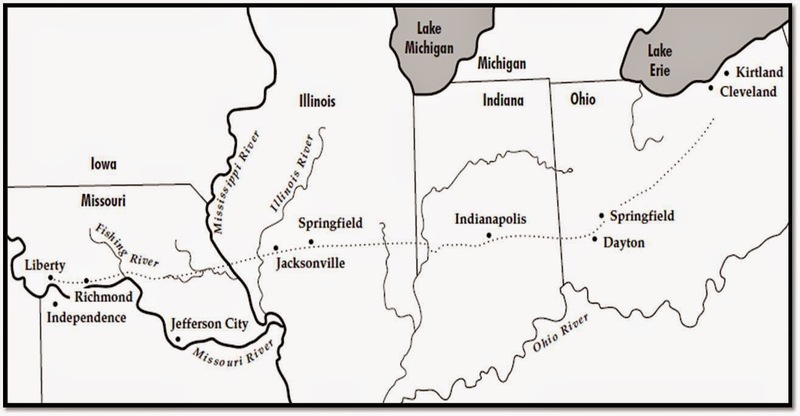 "The first of May  we left Kirtland for New Portage, about 50 miles, where the brethren were to meet with us for Missouri. At this place on May 6, 1834, the [Zion's] camp of the Saints was organized for our journey by the Prophet Joseph Smith. Every man gave into the treasury, the amount of means he had for the journey except those that had families who were directed to provide for themselves inasmuch as they had means to do so. The company was divided into messes of ten persons each with a captain to each ten, and over each five, ten or fifty persons there was a captain of fifty and over each hundred, a captain, according to the ancient order of Israel. Eunice and Chandler also settled in Missouri, close to Nancy and Joseph, and suffered many of the same persecutions that they underwent. Eunice crossed the plains and she and her husband settled Filmore, Utah. One story I read said that she and her husband later ended up adopting two Indian girls who had been taken prisoner by a different tribe of Indians. The Indians were trying to sell the girls as slaves and if the settlers wouldn't buy them they would kill them. Joseph Holbrook listed her in his account of Zion's Camp, but nothing else is known about her or who she was. Aurelia and Osmon settled in Missouri and later took care of Aurelia's younger sister, Mary. Mary's daughter, Charlotta Juline Markham Crow, wrote this about her aunt. Aurelia died in Nauvoo in February 1845, she was only 26-years-old. There were two other children that also traveled with Zion's Camp, Sarah Pulsipher who was the daughter of Zera Pulsipher and Almira Winegar who was the daughter of Samuel Winegar. As I studied these women's lives and their experiences I was so touched by their courage and their faith. These women wanted Zion and they were willing to sacrifice everything for it if needed. Their examples remind me that if we want Zion to be redeemed, if we want to help build God's kingdom, it takes courage, sacrifice and willingness to follow the prophet through thick and thin. I hope that as you study the Doctrine and Covenants in the future, specifically sections 103-105, that you will remember these women and that they also marched with Zion's Camp. "All victory and glory is brought to pass unto you through your diligence, faithfulness and prayers of faith." Thank you Heather for the work that went into this post. It does my heart good to learn about the experiences of women in history. I visited the Mormon Batallion Historical Site in San Diego recently and appreciated learning there about women and children who traveled with the Mormon Batallion. Check that out if you haven't already. I'm glad you enjoyed it! I read during my research for this post about the women in the Mormon Battalion, I didn't know that there were women included! I will have to read up on that too. Thanks for the suggestion. Thank you for writing this! My husband taught a lesson about Zion's Camp when he was in the Elder's Quorum Presidency, and the church history manual he used as a resource mentioned just the number of women who were in the camp, and I remember wondering about their stories, so this post was exciting to see! Some really interesting stories, too! The Mormon Batallion is a really cool place. If you ever get the chance to go to San Diego it is a great family activity, and an interactive learning experience run by sister missionaries who talk about some of the amazing women who were apart of it. Oh, I love this. Charlotte Alvord & Lyman Curtis are my 5th great-grandparents. I wish I knew more of Charlotte's motivations as well. Her mother passed away when she was ten years old, and family history notes that she was mothered by many of her sisters in the Gospel. Perhaps one of those surrogate mothers was also in the camp. I'd love to ask her some day! Thanks for shining a spotlight on these brave women, Heather. Thanks to Dr Ekaka for the good result i got from his spell last week, My husband that was sentence 7 years in prison for something he knew nothing about, has just before released under 2 years with the help of Dr ekaka Email: ekakaspelltemple@yahoo.com i am so excited having my lovely husband back home. It still just like a dream to me that their are still powerful men like Dr Ekaka who can say something and it will come to pass. I finally sat down to read this tonight. So many inspiring stories! Thanks for putting them all in one place. I have a special place in my heart for Zion's Camp.